Combining scallops and maple syrup in the same recipe was not obvious to me at first, but given some time to think about the wonders of each ingredient it seemed only appropriate to try a recipe with both. I decided to see what other chefs are doing with scallops and more obscure recipe combinations. It turns out some are not shy with their scallop recipes and are partnering them with everything from mozzarella to peanut butter. Well then, why not!? When it comes to bacon and maple syrup, who among the meat-loving crowd does not on occasion use a piece of bacon to wipe up a bit of (the generously distributed) syrup that has dripped down off pancakes or waffles? This is starting to sound really, really good. Let’s get started! 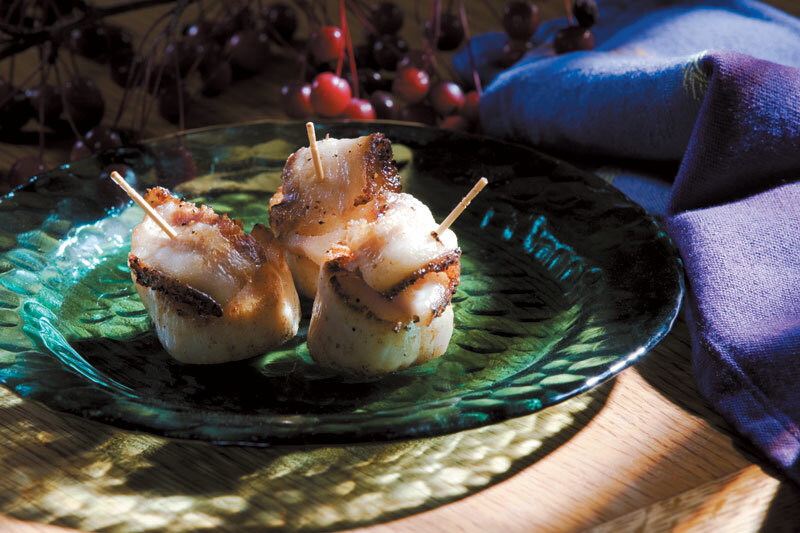 Wrap 1/2 slice of bacon snugly around each sea scallop and secure with toothpick. Set scallops on rack over broiler pan. Baste scallops with 1/4 cup maple syrup and broil 5 minutes. Turn scallops over and baste with remaining 1/4 cup maple syrup. Broil another 5 minutes or until bacon is crispy. Serve hot or at room temperature.